Roux-en-Y gastric bypass (RYGBP) is one of the most commonly performed bariatric procedures for morbidly obese patients. It is associated with effective long-term weight loss, but can lead to significant complications, especially at the gastrojejunostomy (GJS). All the patients undergoing laparoscopic RYGBP at one of our two institutions were included in this study. 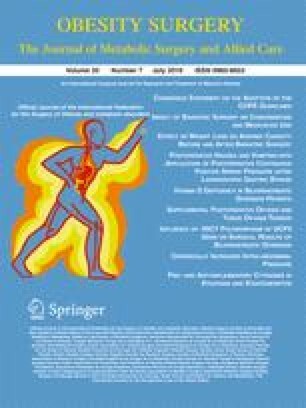 The prospectively collected data were reviewed retrospectively for the purpose of this study, in which we compared two different techniques for the construction of the GJS and their effects on the incidence of complications. In group A, anastomosis was performed on the posterior aspect of the gastric pouch. In group B, it was performed across the staple line used to form the gastric pouch. A 21-mm circular stapler was used in all patients. A total of 1,128 patients were included between June 1999 and September 2009—639 in group A and 488 in group B. Sixty patients developed a total of 65 complications at the GJS, with 14 (1.2%) leaks, 42 (3.7%) strictures, and 9 (0.8%) marginal ulcers. Leaks (0.2% versus 2%, p = 0.005) and strictures (0.8% versus 5.9%, p < 0.0001) were significantly fewer in group B than in group A. Improved surgical technique, as we propose, with the GJS across the staple line used to form the gastric pouch, significantly reduces the rate of anastomotic complications at the GJS. A circular 21-mm stapler can be used with a low complication rate, and especially a low stricture rate. Additional methods to limit complications at the GJS are probably not routinely warranted. The authors declare no conflict of interest in relation with this manuscript.